School Psychologist (NASP, CASP, or TASP members) | American Professional Agency, Inc. 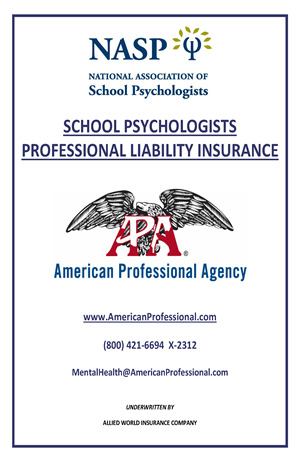 The National Association of School Psychologists sponsors our School Psychologist Professional Liability Insurance Program. As a member of the National Association of School of Psychologists you are eligible to purchase the professional liability insurance providing that you are credentialed in school psychology in the state in which you practice. Coverage is available for employed or self-employed School Psychologists and we offer full-time and part-time rates for individuals. We also provide professional liability insurance coverage for practice groups.